Most of the people whether associated with a retail business or not are familiar with old traditional POS system. This system includes as credit card terminals, cash registers and barcode reader etc. This system used with cable support, therefore, payments mess could be seen on or under the table. Ink and paper were the strong requirements of receipt printing, it seems difficult to continue if, one is running out of it. 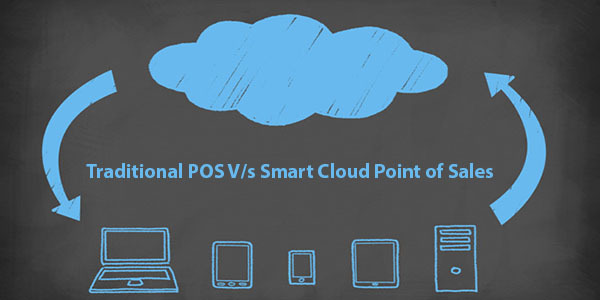 Traditional POS system was an old one, today we have a smart cloud point of sales system available in the market. These are smart devices based systems and mostly used by today’s vendor. This system is easy to operate with the support of mobile phones and tablets. This is a compressive solution for your business whether it is associated with retail, some coffee shop, and restaurant. Change from an old traditional POS system to smart and mobilized point of sales is undoubtedly a big one. Businesses already have the traditional one should seriously consider to move on along with technological requirement. This migration may boost your business growth, success and revenue equally. The smart cloud point of sales system is full of amazing features that a traditional POS ignores. Here are some of the major advantages enlisted to ensure your understanding. Being a business owner, the smart cloud point of sales is going to equip you with all essential tools of success. It will share real-time insights of your business, customers, and inventory that you want to know at the time of decision making. A smart cloud point of sales system is easy to customize according to your business requirements and specifications. It is specially designed to get modified according to business niche and core requirements. Let us have an example if you’re an owner of a coffee shop and purchase a smart POS for that. Later on, you want to enhance your coffee shop as a restaurant, no need to purchase new POS system with that too. Because smart POS could be easily customized according to updated requirements. The greatest advantage of a smart cloud point of sales system is its storage. No need to spend your time on software installation and upgrading. Because it will automatically update complete system if cloud service provider has made some changes they’ll update too. All of the updates are automatic, instant and free, therefore, business doesn't have to take care of it. It is quite cost effective for businesses because of no need to spend extra on purchasing new hardware and their maintenance. Enhanced business engagement, easy implementation, regular maintenance and much more things encourage the business owner to switch towards smart cloud point of sales.